Unique and powerful, Quick Clean Micro-Steam Bags eliminate 99.9% of all harmful bacteria and germs from most breastpump parts and feeding accessories. Economical�up to 20 uses per bag This purchase is for ONE BAG only good for 20 uses! This is for one bag only for 20 uses! 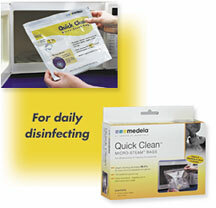 $1.04 Need to add Quick Clean wipes?